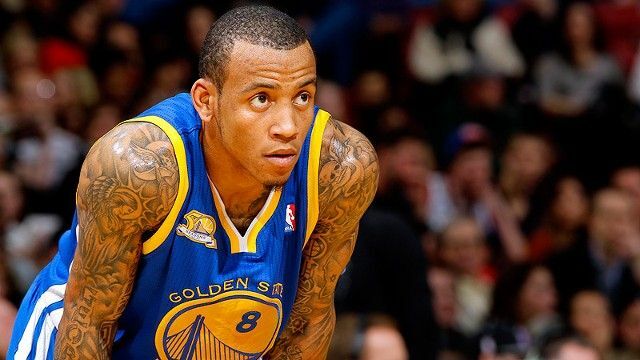 The Warriors and Bucks finalized the first major trade of 2012 last night, with Monta Ellis, Ekpe Udoh, and Kwame Brown heading to Milwaukee in exchange for Andrew Bogut and Stephen Jackson. After this season, Ellis is owed $11MM annually over the next two seasons, with an opt-out for the second year. Udoh is still in the midst of his rookie contract that will be guaranteed until he is eligible for a team option after the 2012/2013 season. Brown and his $6.7MM salary falls into the deal as an expiring contract. Bogut is still owed a total of $27MM through the end of the 2013/2014 season, and Jackson has one year remaining after this season that will pay him approximately $10MM. Each side of the deal totals about $21MM in 2011/2012 cap figures, so neither club is adding or reducing salary for this season. In the end, the Milwaukee Bucks ended up freeing up about $15MM in cap space for next year. Stephen Jackson returns to the team in which he had a tumultuous exit in 2009, but with reports of unhappiness in Milwaukee due to an irreparable relationship with coach Scott Skiles, he finds himself out of that situation. The deal also hinges on the health of Andrew Bogut. If he can fully recover from a broken ankle suffered earlier in the season, Bogut becomes the mainstay at center for Golden State. Milwaukee receives a dynamic and explosive combo guard in Ellis, who had been averaging 21.9 PPG, 6 APG, and 1.5 SPG in 36.9 MPG. It will be interesting to see how Skiles handles the shots between Ellis and Brandon Jennings, as the Bucks traded two players that are not currently in the rotation for Ellis' 19 FGA (Jennings currently averages 17 FGA). Udoh, formerly picked by the Warriors with the 6th overall selection in 2010, is an intriguing prospect for the Bucks moving forward. Most importantly, it may help cover up the potential loss of forward Ersan Ilyasova to free agency, who recently said that he may leave the Bucks in the offseason for whoever offers the most money. It is questionable if Brown fits in Milwaukee's long term plans, as he is due to be out for the rest of the year while recovering from a chest injury and is slated to become a free agent this summer. Considering the Ellis deal put the Bucks in a better position to make a run at the postseason this year, I'd guess the trade they're discussing would bring in short-term help. Mbah a Moute's contract isn't especially burdensome, since its annual value declines each year, but it does run through 2015. It will be interesting to see whether Milwaukee would have to take back another long-term deal, or whether they'll look to add another expiring contract to Kwame Brown's. With Bogut gone and Mbah a Moute potentially on the move, it seems the team hopes to clear cap space to re-sign Ersan Ilyasova. One thing to point out about this trade is that Jennings has anyways said that he wants another star around him, and Monta Ellis provides that star power. This might be a sign that the Bucks are serious about keeping Brandon Jennings in Milwaukee. They need more then just Ellis, however. The Bucks need to focus on replacing the center position they lost in Bogut. But, that's been a concern since Bogut went out a month and a half ago to his ankle injury. The NBA draft will consist of a lot of talented centers, so the Bucks should be fine in that aspect. I think the other big focus will be to keep Ersan Ilyasova in town and not lose him to go play in Turkey. Ersan, who was named Eastern Conference Player of the Week yesterday, is averaging 12.2 PPG and 8.7 RPG for the Bucks this season, which is formulating to be his breakout year. As far as the bench is concerned, the Bucks have a deep, reliable bench that I think has helped them on numerous occasions so far this season. And, as far as their contracts look, in theory they should almost all be back next season. So, what do the Bucks do now? Do they build the team around Jennings and Ellis? Do they forget about this potential playoff run and focus more on the draft lottery? One thing is for sure, they have a big weight lifted off their shoulders with the departure of the injury prone Bogut and the locker room moral killer Jackson. Bogut is a great player, but he is useless when he gets injured every year over long periods of time. There is equivalent talent out there, both free agent players and also available in the upcoming draft. And for Jackson, well, Jackson will always be Jackson no matter where he goes. If Hammond and Buck's front office are smart, which they showed signs of by making this trade, there just might be a glimpse of hope for Milwaukee and its future success.